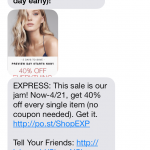 SMS Marketing has been around for more than a decade now but this is still a new and exciting tool for brands and agencies. Many organizations use this tool in conjunction with their other marketing tools such as e-mail marketing, mobile app marketing, voice call marketing etc. 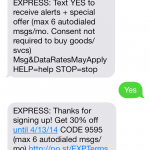 Other organizations use the SMS Marketing tool as the focal point of their Mobile Marketing campaigns. 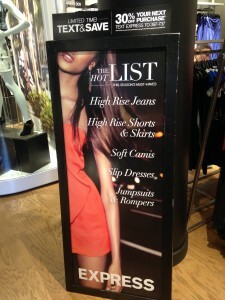 The direct access and interaction is very appealing not only to brands but also to consumers. 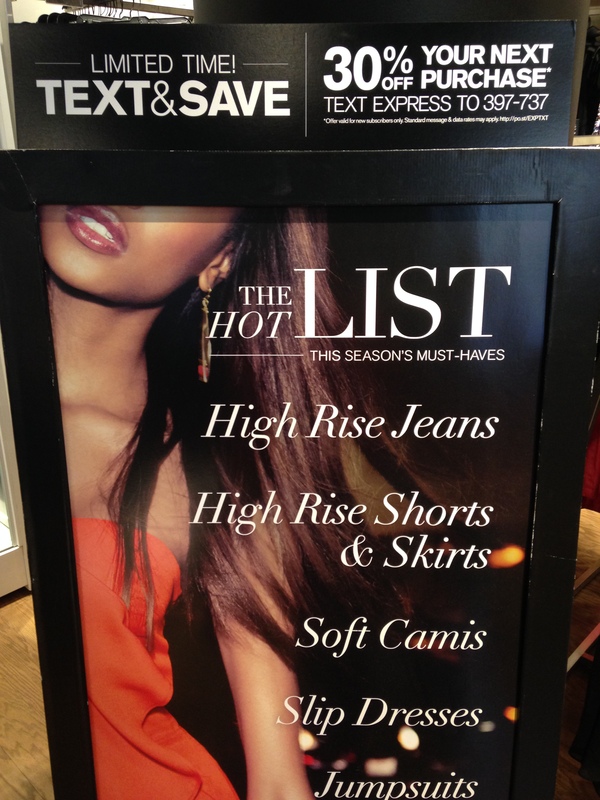 I was walking around New York City this past weekend and stopped by one of my favorite shops, Express. I was greeted by a lovely host who pointed me right away to a large poster that was advertising the SMS and MMS campaigns Express is running in their stores. The poster is sophisticated yet simple. 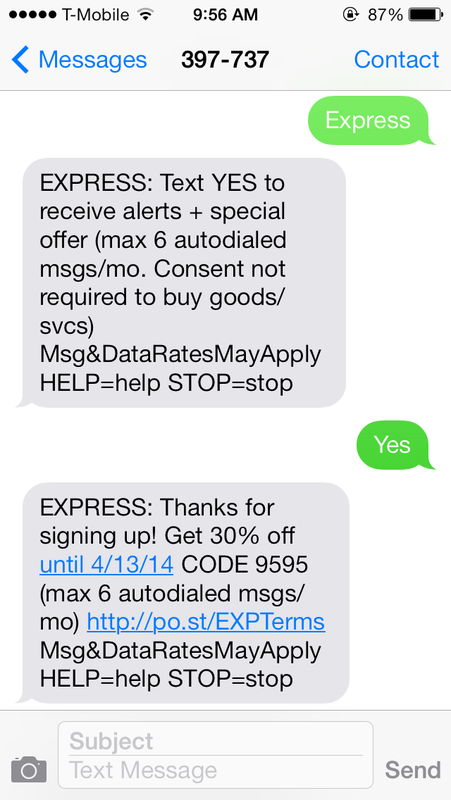 I received an SMS auto-reply message right way. This message introduced me to the program, message frequency, and asked for my permission to receive future promotions. Since subscribers phone numbers are a very personal and direct access to them, Mobile Marketing via short codes has a list of compliance requirement that all Mobile marketers and Mobile Marketing providers need to follow based on industry standards (www.mmaglobal.com). Some of these requirements (such as message frequency, program name, etc) were part of the initial message. 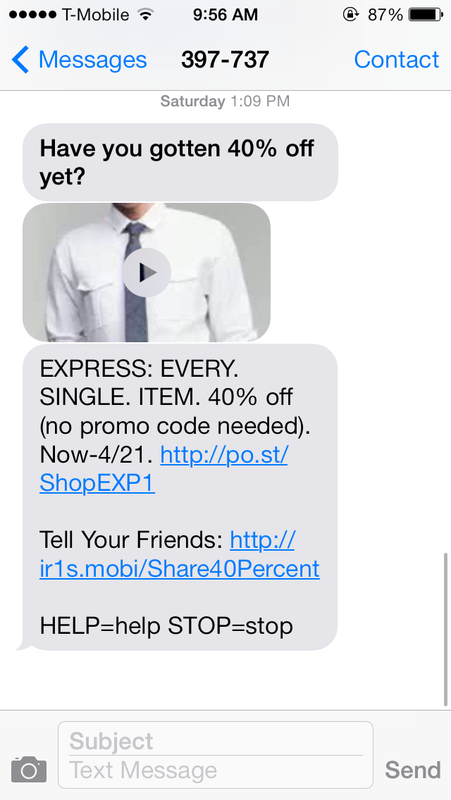 A few days later I received an MMS (Mulitimedia Message Service) alert regarding EXPRESS sales that included a picture. 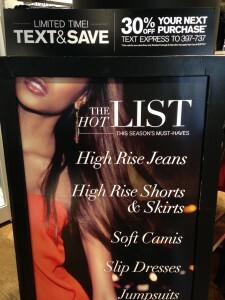 The second alert followed three days later, also as an MMS promotion and I was pleased to see a short video that displays the latest Express trends and clothing line along with a 40% off coupon. 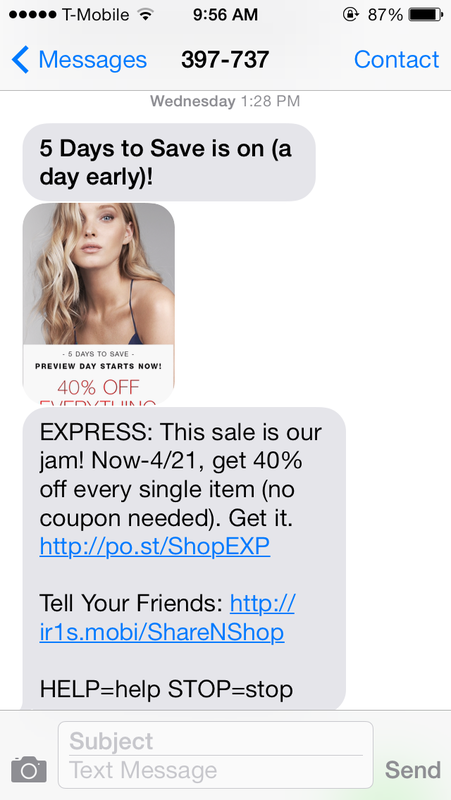 Express is going a great job in not only sending their customers great SMS and MMS offers but also creating brand awareness and engaging its customers. 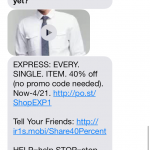 They are balancing between having immediate access to their customers via SMS and MMS campaigns but also not overwhelming them with a furry of SMS and MMS messages on daily basis. This balanced approach will result in greater audience, greater brand recognition, and ultimately greater sales for Express.